St. Helena Sound South Carolina. 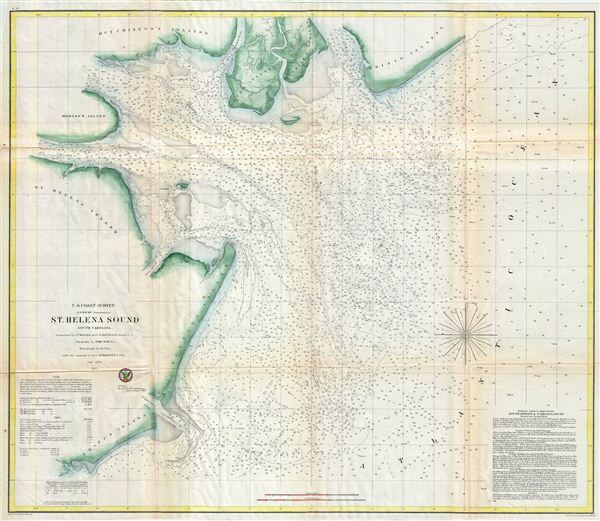 This is an appealing mid-19th century U.S. Coast Survey nautical chart or map of St. Helena Sound, South Carolina. The map covers from the edisto Islands south past MorganIsland and St. Helena Island to Fripps Island and Skull Inlet. Saint Helena Sound is a coastal inlet connected to Beaufort and Colleton counties. The Combahee River empties from the Northwest and the edisto River and Ashepoo River from the North. Today the Intracoastal Waterway crosses the sound. This chart offers some of the Coast Survey's earliest work in this region. The map features countless depth sounding and shading to indicated shoals and other undersea dangers. Sailing instructions and notes pertinent to the mariner appear in the lower left quadrant. The triangulation for this chart was accomplished by C. P. Bolles and C. O Boutelle. The topography is the work of John Seib. The hydrography was completed by a party under the command of J. N. Maffit. The whole was compiled under the supervision of A. D. Bache, one of the most influential and prolific figures in the early history of the U.S. Coast Survey. Very good. Blank on verso. Minor toning on original folds. Verso repair and reinforcement along original fold lines.